Anyone who’s been watching the Rays chase down the Red Sox for the lone American League wild card spot knows Tampa Bay’s pitching staff (3.59 team ERA, 2nd best in the A.L.) has kept opposing hitters on their heels all season long. Lately, I’ve seen countless baseballs, and even several bats, careen dangerously into the stands, which begs the question… what is acceptable behavior when catching a foul ball? 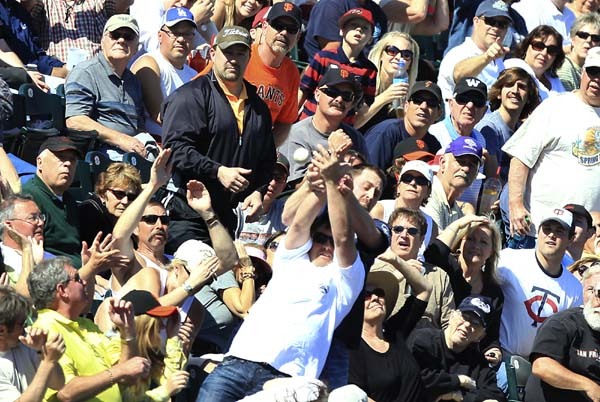 In a crowded stadium, when a foul ball flies into the seats, it’s not uncommon to see rabid fans throwing elbows, scratching and clawing, losing their balance (and their sensibilities) while jockeying for position into the projected spot said baseball might land, all the while potentially hurting someone, just for the opportunity to catch an item they can much more easily purchase at their local K-Mart for $2.99. I know times are tough, but goodness. It’s all fun and games until someone loses an eye. Are the memories of catching a foul ball really worth risking bodily harm? Son, remember that time I took you to the ballpark and we wrestled that person to the ground for this here baseball? Good times! Why do we suddenly, almost inexplicably, reduce ourselves to caveman status for a simple piece of rawhide? Never mind the fact that these line drive projectiles often fly at us at speeds in excess of 100 mph. If I’ve got a Fenway Frank in one hand and luke-warm, over-priced beer in another, with no means to protect myself, consider me ducking. No souvenir is worth a black eye or getting jacked by some crazed fan who doesn’t know how to behave around his fellow man. Isn’t it more far gratifying to give the ball you just caught to the six-year old sitting next to you, rather than stepping on his neck to catch it? Civility ends where foul balls begin. Ballparks become bar brawls at the crack of a bat. I’ve been in my fair share of bar fights. Trust me, they never end well. So how do we determine protocol? After all, this isn’t Central American soccer. A century’s worth of baseball games and haven’t we established some sort of rapport with the fans next to us by simply saying “I got this!” Instead, we resort to clawing him in the face? Just doesn’t seem right. Fans, I know we can be crazy when our team’s livelihood is on the line but let’s come to our senses when it comes to snatching a (very small) piece of Major League history at the expense of another’s well-being. The memories of attending the game should be good enough. This entry was posted in Diamond, Featured and tagged Boston Red Sox, Fenway Franks, MLB, Tampa Bay Rays by Chris Humpherys. Bookmark the permalink. I think we all, or at least most of us, were raised under that school of thought. 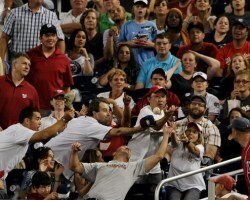 In fact, I’ve seen people get heckled ruthlessly for catching a foul ball and not giving it to the kid near them. Civility ends at the bottom of the jerk next to you sixth eight dollar beer. I’ve had to shield my grandson from some dumdass that thought it was ok to knock a little kid over to get to a freaking baseball. Sad but true. I figured you’d appreciate, Aer. ‘Bout time some of us learn how to act, huh? As always, enjoy a glorious football weekend, sir. I guess things really got vicious when Elvis the Pelvis discarded his towel or whatever else was expendable… Kinda like the guy on Black Friday that has to open the door first thing in the morning! Katy bar the door! LOL! Geez Chris this is a downer! I didn’t want to bring up the Hamilton incident. That was a true tragedy. I never found out what the Rangers organization did for their family but I’m assuming Nolan Ryan and company did the right thing. You didn’t catch a sweat-soaked Tom Jones wife-beater back in the day, did you? I’d keep that to yourself. First of all, I thought it was the women throwing their underwear at Tom, not the other way around. And now for something totally off topic- what is your opinion of the goings on in the Big 12? You gonna make your picks on SRM? It’s the ” baser instinct” in us all to behave like that ! I mean look at what happens within the Congress and Senate on a daily basis as a way to adjudge society . If those pompous and self serving ” as@@oles “ can’t provide an example as to have behave with some dignity then what makes you expect a fan at a sporting event to be any different ? I get that a lot on karaoke Wednesdays. I’m sure that comes as no surprise to you. Oh, and good pinata comparison. But kids chasing recklessly after candy bars, I can understand. Grown men elbowing each others ribs while trying to catch a baseball is another altogether. Oh, and re: conference realignment, I’m still waiting to see how this all shakes out. Like I mentioned earlier, the same people who have been clamoring for a college football playoff all these years are the same ones who are now bitching about conference realignment, which ironically, will bring us closer to a playoff. As long as we can all agree money is driving all this, I think we’ll get along just fine. I’ll expect a formal apology later. It should be a national tradition that all visitor foul balls be thrown back. This would eliminate some of the problem. Praise the Cub Bleacher Bums for initiating this idea way back when Mr. Cub played position #6. Look, it’s human(animal) instinct to chase the worthless souvenirs. It’s part of Americana that is here to stay. If more of us behaved like congressmen, well, let’s just say this country would be a far dimmer place in which to reside. Well said on both counts, RB. Never understood the allure of a $3.99 baseball. It’s absolutely ridiculous. Although it’s a little different if it’s a milestone hit and you’re sitting in the bleachers…but grappling/fighting for a ball and getting hurt (or injuring others around you) just isn’t worth it. How about that guy years back that dove out of the stands to catch that field goal? And true, back in the day, when Bonds was chasing the Home Run record and we all thought it meant something, I’d probably claw someone’s eyes out for the opportunity at early retirement. Congressmen behaving ? Look there are things many of us aspire to ………… I now doubt that being a federal legislator is now one of ’em ! Saw comedian Bill Bellamy do his stand up gig as well as seeing J Cole perform at Jannus Live . Great performances ! Now it’s on to see how things pan out in the NFL as well as in baseball . I hear that a cardiac surgeon is about to be called in by the Red Sox front office ? They need one , do they not ? Look down this list of #1 picks within the NFL but only consider over the last decade ? Who to your mind would you …… consider the “biggest bust” of them all ? So now both of the leads in the wildcard races are now down to a mere one game. Why oh why should I have any faith in either the Braves or Red Sox at this juncture ? With that and the Pats stinkin’ up the joint like the rancid stench from the entrails of a dead dog ! I think it’s fair to say that sporting weekend wasn’t all that great ! And at the college level not all of the football games weren’t that great . Well now that LSU is #1 let’s see if they can hold unto that top spot . All-time #1’s NFL Style A Brief Glimpse Into Reality …. The Sox are circling the drain and, as of tonight, are now tied with the Rays with two games to play. I may hit either Tuesday’s or Wednesday’s game. Re the biggest bust of the past ten years? It goes without question that Russell takes that top spot. Who’s number two though? I’d have to say either Carr or Smith. I’ll be over soon to check out your latest. It’s been rumored that Waste Management will tender a bid with the Red Sox to take out the garbage . I can’t put it anymore succinct than that ! A month ago the division was literally theirs’ for the taking . I know that the white flag of surrender hasn’t been raised but the French Embassy in DC has been calling the front office of the Red Sox to offer their advice . “Nous Abandonnons” —– translation “We Surrender ” ……….. I think that’ll work for the Red Sox and their fans ! Don’t you ? David Carr and Alex Smith should form a comedy (duo) act and take it on the road . ! But then again having seen the exploits of McNabb this season I think that Donovan could outperform them both on his own . I’m not saying the situation is dire for the Vikes’ but I hear Zygi might put a call out to Brett . Tarvaris Jackson is now trying to justify Limbaugh’s statement about the black quarterback . Paul Allen might want to rethink that $7million salary he’s paying Pete Carroll and in invest it in some personnel for the Seahawks . Damn ……. that team is bad ! Tonight, the Rays are throwing Hellickson, one of the best one pitchers in the league. He’s been money all season. The Sox are throwing Bedard, who they just picked up. If they can’t get it together, their season will be out the door. The Rays have all the momentum. At this point, I really like their chances. Either way, these games are must-wins for both teams. If Carr and Smith take their comedy team on the road, will Carson Palmer open for them? Re: The Vikings, Al, Adrian Peterson is sixth in the league in rushing yards and sixth in carries. I’m thinking they should give him the ball a little more. I love reading thrillers but damn man, this end to the regular season in baseball couldn’t have been scripted any better . Well that’s with the exception the meltdown by the Braves and Red Sox . Hellickson will go for broke for the Rays tonight just as long as the rest of the team doesn’t become complacent I can see them pulling of this feat . I now defer to you on all things concerning the Rays ! Speaking of which MNF Bucs and Colts is already a sellout ? What a surprise ? Carson Palmer opening up for the duo ” Carr Smith” with McNabb as one of the performers somewhere as part of that spectacle . It will be hosted by either Tarvaris Jackson or Kerry Collins . So Mayweather now wants to make his last opponent Victor Ortiz and his promoter Oscar de La Hoya his bi@ch ? All this fallout from a bout that the referee had the balls should’ve disqualified both fighters ! Ortiz and De La Hoya are angry that Money has simply reneged on the deal for a rematch . What did they expect to begin with ? Mayweather isn’t a guy who has any integrity whatsoever ! I mean he gets off on beating on his women and his kids ……… so what makes both Ortiz and his promoter think that they were dealing with someone who’s rational ?